Here is a list of Best Free DNG Converter Software For Windows. Using these software, you can convert DNG images to other popular formats. Different software support different formats for conversion of DNG images. Some of these image formats include AVS, BIE, BMP, PNG, JPG, GIF, DICOM, DCM, DOT, SPX, FAX, DDS, DCX, PCD, PCX, PICT, TIF, TIFF, VIFF, XBM, XCF, XIF, etc. Many of these DNG converters are also capable of converting DNG images to an animated GIF. You can do so by combining multiple DNG images into an animated GIF at the desired frame rate. As you explore the list, you will find some software which support 50+ image formats for DNG format conversion. Some of these are batch DNG converter which can convert multiple DNG images to another format. In some of these DNG converter software, you can also change the properties of an image before converting it. These image properties include RGB pattern, Chroma Subsampling, blue scale, red scale, gamma, brightness, etc. Besides this, watermark feature is also available in some software. You can add watermark to the images by importing an image or writing a text. I have also added a software in which you can remove the red-eye effect from an image. Picosmos is one of my favorite DNG converter software. It is basically an image processor and prior to DNG conversion, you can edit DNG images too. It also lets you combine DNG images to an animated GIF. ImBatch is another favorite DNG converter software for Windows. Firstly, it supports more than 50 formats for conversion. Secondly, it comes with a Beep On Finish feature. You will hear a ring after the conversion process gets finished. Also, it is a batch DNG image converter software. Apart from this, you can also add watermark to the images. You may also like some best free JFIF To JPG converter, WebP to GIF converter, and GIF Speed Changer software for Windows. Picosmos is one of the best DNG converter software for Windows. It is basically a feature-rich image processor and supports DNG format natively. Using it, you convert single DNG image or even batch convert DNG to other popular formats. Editor: Here, you can convert one image at a time. This section is generally used to edit an image. Multiple tools are available in this section by which you can edit an image, like pen, brush, blur, eraser, rectangle select tool, lasso tool, etc. These are only a few of editing tools, it provides a wide range of drawing and editing tools in actual. You can check its full review here > Picosmos Tools. After editing DNG image, you can use its Save As option to convert DNG to another format. Combine: Use this feature to make a collage by combining more than one DNG images. Initially, the size of the collage is set to 3 x 3. You can change this size as per your requirements. Batch: Here, you can carry out batch DNG image conversion. To do this, firstly, open all the images in the software. After that, expand Batch menu and select Convert option. You can convert a DNG image to PNG, JPG, WebP, BMP, and GIF formats. Before converting an image, you can vary its quality and limit the maximum resolution. This software is also useful in creating an animated GIF with DNG images. You can do so by using Animation tool provided on its interface. Just import desired DNG images and create an animated GIF. For this purpose, you can customize its frame rate in seconds. Moreover, different GIF effects are also available in the software such as erase, erase color, gradient, mosaic, etc. You can also preview the animated GIF before saving it by clicking on the Play button. The total time taken by the software in importing the files and batch conversion is also displayed on the interface. Along with this, it also shows the total number of files imported, total number of files converted, and total size of the files. You can add watermark to the images as an image as well as a text. You can also select the location of the watermark to be placed on the image. But, this feature did not work properly while testing. You can rotate an image at 90 degrees and 180 degrees. Flip horizontal and flip vertical features are also available in the software. Batch Print option is also available in the software. Import is a module which can be used import a folder containing the DNG images to Picosmos. Using this feature, you can save your time as compared to manual importing. Before importing the DNG images into the software, you can set the minimum file size in KB. ImBatch is a free DNG Converter software for Windows. As its name implies, it is a batch image conversion tool for Windows. Start by adding DNG images into the software by drag and drop method. All the added images will be available on the left panel of the software. You can preview an image by selecting it and clicking on the Eye-shaped button on the toolbar. In the Preview section, it also shows the before and after images. Now, click on Add Task button, select Save As option, and select the format into which you want to convert the imported DNG images. Here, you will also find Save to Animated GIF feature. Using this feature, you can convert the DNG images into animated GIFs by combining them and setting their frame rate. Before conversion, you can also change the image properties, like RGB pattern, Chroma Subsampling (high, medium, and none), image quality, etc. Moreover, you can also select whether to compress the images before conversion or not. It also lets you add a watermark to the images. ImBatch lets you convert the DNG images into more than 50 image formats. Some of these formats include AVS, BIE, BMP, PNG, JPG, GIF, DICOM, DCM, DOT, SPX, FAX, DDS, DCX, PCD, PCX, PICT, TIF, TIFF, VIFF, XBM, XCF, XIF, etc. Beep On Finish: It is an interesting feature of ImBatch. You will hear a ring after the conversion process gets finished. Moreover, it also displays the following information: total time taken to convert the images, total number of images processed, time taken to convert per image, and megapixels converted. XnConvert is another free batch DNG converter software for Windows. Like ImBatch, it also supports 50+ image formats for conversion. 92I – TI Bitmap, Windows Bitmap, CSV, DDS, DCX, DIS, SPX, ICO, GIF, GRO, GBR, EMF, FTS, PNG, JPG, TIFF, RGB, RAW, XBM, XPM, WBMP, and WEBP are some of these image formats. 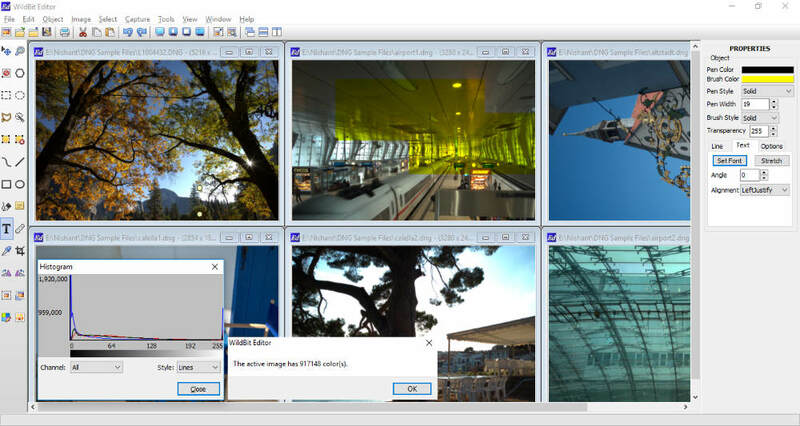 You can import the DNG images into the software by selecting them individually or adding a folder containing DNG images. Besides this, you can also import images by drag and drop method. Format: Select the desired output format to convert DNG images. Folder: By selecting this option, you can select the location to save the converted file on your PC. Email: Select this option to email the converted files. Zip: All the converted files will be saved in a Zip folder. FTP: Select this option if you want to share the converted image via FTP server. You can also share the converted files on Picasa and Flicker. In the Actions tab, you can edit a DNG image and compare the before conversion and after conversion view of images. Resize, crop, rotate, add filters, add watermark, set DPI, etc. are few of the tools you get to modify DNG images. You can view the conversion status in the Status tab. In this tab, the total number of input files, total number of files converted, and the time taken by the software to complete the conversion is shown. PhotoScape is a photo processor software for Windows. It is a multipurpose software which can be used as image viewer, image editor, batch image editor, animated GIF maker, splitter, RAW converter, color picker, etc. You can also use it as a DNG converter software. Launch the software and click on Raw Converter button. This will open the converter window where the conversion process is carried out. Now, click on ADD button to add all the DNG files and click on Convert button. By default, it converts the DNG images into JPG format. You can also convert a DNG file to other popular image formats, but the process for this is slightly different. 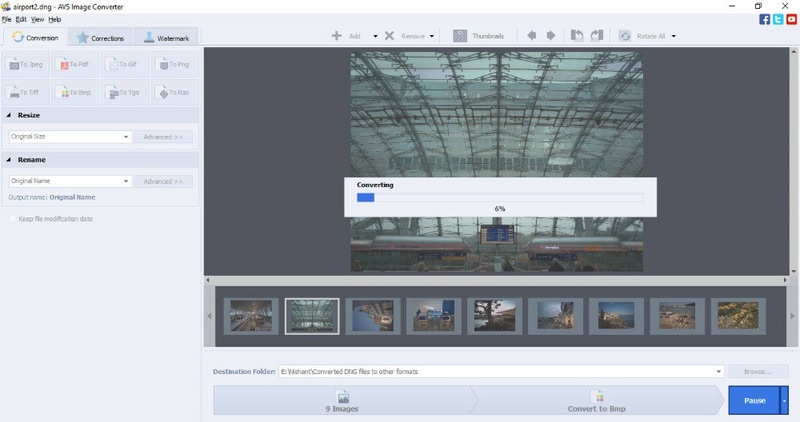 After opening the DNG files in Raw Converter of the software, select any of the images and click on Preview button. After the image is previewed in the software, SAVE option will become available. Click on Save button to save a DNG file in other image formats which include JPEG, PNG, GIF, BMP, TIFF, etc. Do note that you can perform batch image conversion only in JPG format. For other mentioned image formats, batch conversion is not available. Able RAWer is another free DNG converter software for Windows which is intended to convert DNG image file into many other image formats. After launching the software, you just have to select the folder containing DNG files. The free version of this software does not let you perform batch conversion of DNG images, hence, you can convert them manually by selecting images one by one. To do this, select an image and go to File > Save As and select the format in which you want to save the DNG image. Multiple image formats are available for conversion which include JPEG, GIF, TIF, PCX, PNG, BMP, TGA, JP2, PGM, PXM, PPM, etc. You can preview any image by clicking on LOAD button after selecting it. You can zoom in an image by using left mouse click and zoom out by using the right mouse click. You can also alter the properties of an image by varying blue scale, red scale, gamma, and brightness. Download IrfanView, one of the popular image editing software. It can also be used to convert one image format into another. In order to view and convert DNG images, an extra plugin is needed by the software because it doesn’t natively support DNG image format. You will find this plugin of IrfanView to view DNG images here. In order to convert a DNG image into other image formats, open a DNG image into the software, go to File option and select Save As option. Now, select the format in which you want to convert the DNG image. Some of the formats available for conversion include BMP, PNG, TIF, TGA, WEBP, ICO, PPM, JP2, EMF, GIF, etc. Go to File > Batch Conversion/Rename or simply press B key on your keyboard. This will open a window for batch conversion. Select the DNG images and click on Add button. After this, all the selected images will be added to the software. Select the output image format in Batch Conversion Settings section and click on Start Batch button. You can also customize output image quality by using options button. Paint.NET is one of the most popular software to view and edit an image. It supports most of the popular image formats but not all image formats. If I talk about DNG image files, it doesn’t support these files. Hence, you have to install Paint.NET RAW File Plugin in order to view and edit DNG image files in Paint.NET. The plugin is downloaded as zip file. Extract it and open the folder. The folder contains two files: dcdraw.exe and RAWfile.dll. Copy the RAWfile.dll file and paste it into the Paint.NET > FileTypes folder. Copy the dcdraw.exe file and paste it in folder \Paint.NET. Restart Paint.NET. Now, Paint.NET is ready to support the DNG format. You can now convert the DNG images into many other image formats (BMP, GIF, PNG, JPEG, TGA, TIFF, etc.) by using Save As option. This option is available in File menu. Chasys Draw IES is another free DNG converter software for Windows. It is an image viewer and editor software which offers multiple features. The interface of this software is slightly similar to one of the popular image editing software Paint.NET. But unlike Paint.NET, it does not require an additional plugin to view and edit RAW (DNG) image files. You can convert a DNG image file in other image formats by using Save As option in the File menu. It lets you convert a DNG image to the following formats: BMP, CUR, ANI, GIF, ICO, GTX, JPG, PNG, JP2, PCX, XPM, etc. Various tools are available in the software by which you can edit an image. These tools include pencil tool, color picker, brush, pattern brush, cloning brush, healing brush, text tool, etc. Digital Image Tool is one more batch image converter software for Windows. Using this software, you can convert multiple DNG images into other image formats which include JPG, BMP, PNG, and TIF. Vary the size of the image. Rotate the image at right angle. Add watermark to the image and vary its transparency. When you are done, you can start batch DNG conversion by clicking on the Process button. All the images will then be converted into the selected format and saved at the user-defined location. PearlMountain Image Resizer is another free DNG converter software for Windows. It is a batch image converter software which you can use to convert DNG images into other formats. These formats include JPEG, BMP, PNG, PDF, TGA, TIFF, GIF, and PSD. The conversion time depends on the total number of images selected for conversion and their size. Before converting a DNG image into other image formats, you can vary its properties, like size, quality, rename it, etc. In this software, you can also create animated GIF(s) by setting their frame rate (in milliseconds). This can be done by merging more than one DNG images into a GIF. NOTE: PearlMountain Image Resizer is free for personal use only. Active Pixels is another free DNG converter software for Windows. It is not a batch image converter software, hence, lets you convert only one DNG image at a time. But, you can open and preview multiple images in different tabs. TIFF, GIF, JPEG, BMP, ICO, PNG, TGA, WBMP, JP2, PSD, PDF, DCX, PXM, PPM, DOT, PCD, DPX, FPX, HDF, MTV, etc. are image formats supported by this freeware for the conversion of a DNG image. Method of conversion of a DNG image into the above-mentioned image formats is not a difficult task. Go to File > Open and select a DNG image which you want to convert. The selected image will be opened. If you want, you can edit the image before converting it. Various tools are available for editing such as rectangle select tool, oval select tool, freehand lasso tool, polygonal lasso tool, pencil, brush, etc. After editing an image, you can save it by using Save As option from the File menu in any of the defined images formats. Honeyview is another free DNG converter software which can convert a DNG image into multiple popular image formats. It is not a batch image converter software, but you can view multiple images in it. It also displays the metadata of an image which includes the file name, file size, and date and time of modification. You will find the convert option in the Edit menu. Before converting, you can rotate and resize the image. A DNG image can be converted into the following formats: JPG, PNG, WEBP, BPG, and BMP. You can view the opened images as a slideshow and set the duration of slides. Moreover, you can also select the style of the slideshow as flip, fade, or slide. You can bookmark your favorite images. Export bookmarks option is also provided by which you can save the bookmarked images in its own format. The opened images can be copied to the clipboard by pressing Ctrl+C button. Before JPEG conversion, you can vary the image quality. You can convert a DNG image to an ordinary GIF image or combine different DNG images into an animated GIF image. For an animated GIF image, you can set the frame rate in milliseconds. Before PNG conversion, you can make it as animated PNG by setting its frame rate in milliseconds. Apart from the above listed options, resize and rename options are available for each type of conversion. In the Corrections tab, you can apply multiple filters to an image, like cold, warm, sepia, negative, black and white, old photo, blur, etc. Watermark: You can add both image and text watermark to an image before conversion and vary watermark opacity. Free DNG Converter is yet another batch DNG image converter software. It converts a DNG image file into five different formats, namely, JPG, PNG, GIF, BMP, and TIFF. Go to File > Open File(s) to import multiple DNG images. After importing, you can select which images you want to convert into the aforementioned image formats. After selecting, click on Convert button and the selected images will be converted into the desired format. WildBit Editor is one more free DNG converter software for Windows in this list. 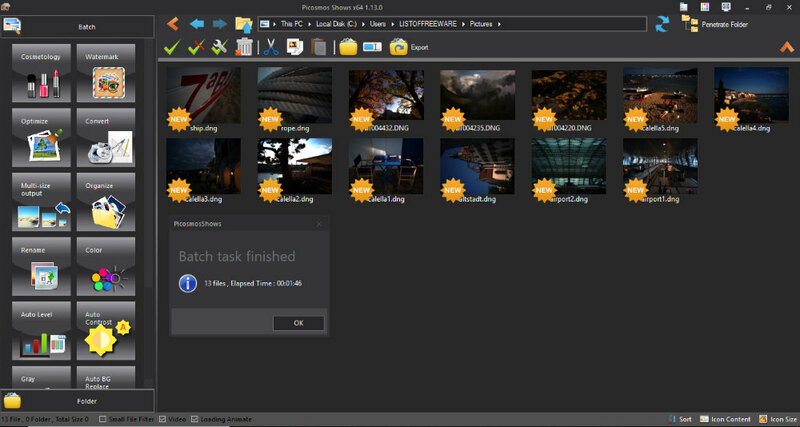 Using this freeware, you can view multiple DNG files simultaneously by arranging them in tiles, but the conversion process is done only for one image at a time. You can convert any DNG image into other image formats by using Save As option which is available in the File menu. Following are the formats in which a DNG image can be converted: TIFF, JIF, GIF, PNG, JPEG, PDF, PCX, TGA, WBMP, etc. You can capture the desktop. It lets you copy the selected part of an image with the help of rectangle tool, lasso tool, and ellipse tool. By using Calc Image Colors feature, you can calculate the total number of colors in a particular image. This option is available in the Image menu. It also plots a Histogram of the selected image. The Histogram is actually the plot of RGB channels. You can view the histogram of red, green, and blue channels altogether or separately. Moreover, three styles of the histogram are available to be selected from, namely, bars, lines, and filled lines. Remove Red Eye feature is given in the software so as to remove the red-eye effect from an image. It also lets you resize and crop an image. You can rotate an image at a particular angle in both clockwise and anticlockwise directions. Text Annotation and Area Annotation features are also available. Using these features, you can highlight a particular area in an image and write some text on an image. DNG Converter converts a DNG image into following five formats: JPG, GIF, PNG, TIF, and BMP. It is a very simple image converter software which lets you convert only a single image at a time. Select the format for conversion. You can change the save location. By default, it saves the converted image in the same folder in which you have stored the DNG files. RAW Image Viewer is another free and useful DNG Converter software for Windows. As the name implies, you can open and view any DNG (RAW) files in this software. After opening an image, you can save it in any of the following formats: BMP, JPG, PNG, GIF, and TIF. You can also resize an image before conversion. Tools to zoom in, zoom out, and rotate an image are also provided. Open Freely is another free DNG converter software for Windows. By using this software, you can convert one image at a time in JPEG, GIF, BMP, TIFF, and PNG formats. Conversion of images can be done by using Save As option available in the File menu. In the Help menu, you can view the file information which includes file path, file size, date of creation, date of modification, and file extension. It lets you rotate an image in both clockwise and anticlockwise directions. Zoom in and zoom out features are also available. You can crop and resize an image. You can also print an image. It comes with a Hex Editor. You can also use this editor to edit an image.